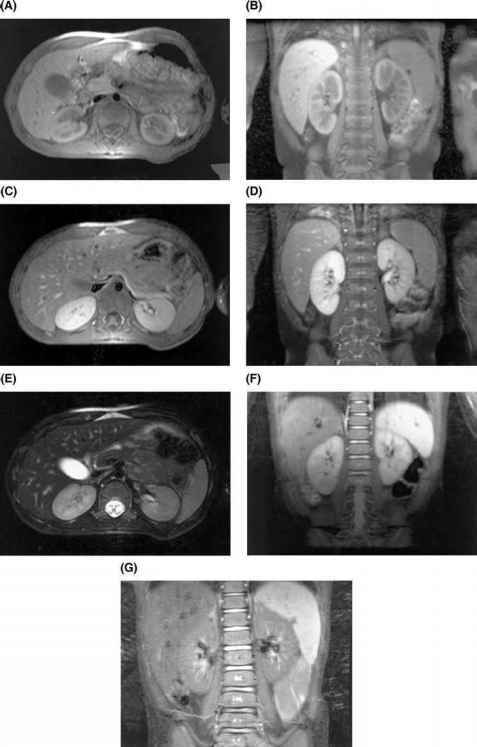 Although the presence of abundant perirenal fat surrounding the kidneys is usually seen as beneficial in MR renal imaging in older children and adults, MRI routinely provides excellent visualization of the kidneys, even in infants and younger children in whom there is relatively little perirenal fat. On spin-echo T1-weighted MR images, renal corticomedullary differentiation is well visualized, with the renal cortex typically having a higher signal intensity than the medullary pyramids (Fig. 1) (5,7,10, 13,17-19). The difference in signal intensity between the cortex and medulla is most pronounced in neonates and younger children. Corticomedullary differentiation is similarly accentuated on inversion recovery sequences (Fig. 1), but can vary depending on the state of hydration. Because infants and young children generally have less hilar fat than adults, the renal hilar regions are usually lower in signal intensity and, therefore, less conspicuous early in life. By early adolescence, their appearance is similar to that in adults. On T1-weighted MR images, the renal collecting systems and ureters normally have a very low signal intensity on spin-echo sequences because of the long relaxation time of urine. The renal vessels also usually have a very low signal intensity related to rapid blood flow in and out of the kidney (20). When flow is slowed, intraluminal signal can be identified. Intraluminal signal can also appear artifac-tually secondary to flow-related enhancement in vessels that course within the plane of imaging. On T2-weighted images in infants, the signal intensity of the renal medulla is increased when compared to that of the renal cortex (Fig. 1). In older children, the renal medulla and cortex both have increased signal intensities on T2-weighted sequences, although the cortex usually has a slightly higher signal intensity than the medulla (5,18,19). As a result, corticomedullary differentiation is less conspicuous on T2-weighted than on T1-weighted sequences. The perirenal fat also appears bright on T2-weighted sequences, and Gerota's fascia appears as a thin, lower-signal intensity line separating the perirenal fascia and pararenal spaces on either side. A chemical shift opposed-phase misregistration artifact at the interface between the kidney and the adjacent perirenal fat produces a characteristic low-signal intensity line along one side of the kidney with a symmetrically high-signal intensity line along the opposite side of the kidney. Recognition of this chemical shift artifact is critical to avoiding misattributing the appearance to calcification (21). for glomerular filtration. 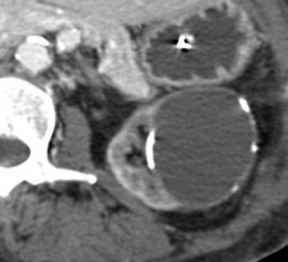 When bound to gadolinium, the path of DTPA through the kidney can be followed easily on T1-weighted images. Renal cortical gadolinium enhancement primarily reflects renal perfusion and glomerular filtration, whereas enhancement of the medulla and opacification of the collecting system depends upon glomerular filtration as well as renal tubular secretion and absorption. The paramagnetic properties of gadolinium cause marked T1 and T2 shortening, which can be tracked on a time-activity curve, thereby generating a functional analysis analogous to that obtained during diuretic renal scintigraphy (8,18,25). However, the markedly superior spatial resolution of MRI (as compared with scintigraphy) enables one to differentiate cortical from medullary enhancement and, therefore, allows one to obtain more accurate measurements of renal perfusion and glomerular filtration. In addition, because of its ability to precisely separate cortical from medullary enhancement, MR renography has the unique potential to noninvasively distinguish glomer-ular from tubulointerstitial pathology (8,23). Differential renal function can be calculated by estimating the volumes of enhancing renal parenchyma for each kidney. 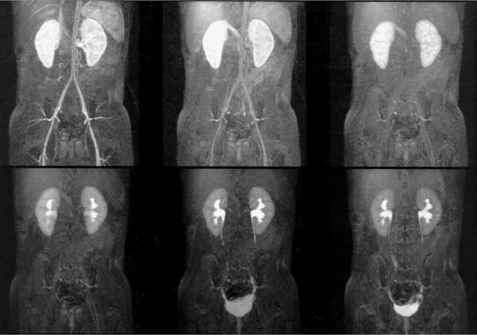 In its original application in pediatric imaging, contrast-enhanced MRU was designed to reproduce the conventional experience with diuretic renal scintigraphy (8,14-16,27). 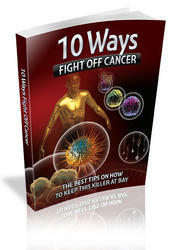 Although the protocol varied somewhat among investigators, the technique has been referred to as the "F+20" protocol because furosemide is administered 20 minutes after the contrast material is injected. The F+20 examination begins with spin-echo T1 and fat-suppressed fast spin-echo T2-weighted images of the kidneys, ureters, and bladder. A bolus of 0.1mmol/kg of Gd-DTPA is then injected intravenously, immediately after which the entire urinary tract is continuously surveyed for three minutes using a dynamic volumetric gradient-echo technique with a time resolution of 15 seconds. The volumetric gradient-echo acquisition is then repeated at one minute intervals for 17 minutes, after which 1 mg/kg of furosemide is given and the imaging is continued for an additional 15 minutes again at one minute intervals. The F+20 technique has two drawbacks (8,14,27). First, the imaging time is very long, such that some investigators have reported that sedated children frequently wake up before the examination is completed. Second, the very high concentrations of gadolinium in the renal collecting systems early during the excretion phase frequently produce severe magnetic susceptibility artifacts, which degrade image quality (8,18). In addition, although plots of signal intensity versus time graphically demonstrate delayed excretion in obstructed systems, they are of little value in quantifying wash-out of contrast material from the collecting system and ureters because signal intensity does not have a linear relationship with gadolinium concentration. As a result, gadolinium signal intensity remains constantly high throughout the examination (8). Figure 1 (Figure on facing page) Normal MRI of the kidneys with different pulse sequences. (A) Axial and (B) coronal noncontrast T1-weighted, fat-saturated images of the kidneys. (C) Axial and (D) coronal postcontrast T1-weighted, fat-saturated images of the kidneys. (E) Axial noncontrast T2-weighted, fat-saturated image of the kidneys. (F) Coronal noncontrast fast spin-echo inversion recovery image of the kidneys. (G) Coronal postcontrast fast spin-echo inversion recovery image of the kidney. Abbreviation: MRI, magnetic resonance imaging.